SynaptiCAD has recently released a new version of it's popular free waveform viewing tool, WaveViewer. The new version adds the ability to read several additional waveform formats, a number of significant performance enhancements, and several new features to improve the waveform browsing experience. 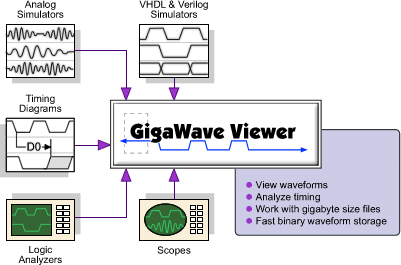 WaveViewer can now read both analog and digital data captured by Agilent mixed-signal oscilloscopes. Support was also added for importing timing parameter data from several FPGA manufacturers: Altera Timing Analyzer Output (*.tao) and Xilinx Speed File format (*.txt). The new version sports 5-20x faster waveform rendering when rendering waveforms containing bus data or analog waveforms. Enhancements were also made to compression of waveform data, resulting in compressed files up to 50x smaller than in previous versions. The PLI shared library that simulators use to directly create the tool's native compressed btim format was also optimized to reduce simulation overhead. With the new shared library, simulations run using SynaptiCAD's own Verilog simulator, VeriLogger Extreme, executed up to 3x faster than previously when waveform streaming was enabled. A number of new features were added to improve browsing and annotation of waveform files, including: sorting visible signals by name, a search tool for finding signals and signal values, and improvements to waveform information dialogs.